Green Tea is probably the most popular tea here in the United States. The popularity of green tea is due to both the surging interest in tea in general as well as the healthful properties of green tea becoming more widely known. For more information about green tea, you may also wish to read the page on this site that provides information about the Different Types of Green Tea. Green tea is a "true" tea, in that it comes from the tea plant Camellia Sinensis. Green tea differs from other "true" teas in how it is processed. Green tea is processed by having the leaves steamed or pan fried soon after being harvested from the tea plant. This prevents oxidation, keeping the leaves soft, pliable and green in color. You can learn more about how green tea, as well as other teas are processed, by reviewing the article about How Teas Are Processed. There are numerous types of green tea available. These differing types of green tea, while they originate from the same plant, all end up differing in tastes and look due to the way the plant is grown and where the tea plant is located. For more information, see the page about the Different Types of Green Teas. 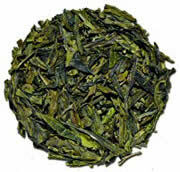 As the name suggests, green tea leaves are indeed green. The tastes of green tea vary significantly. What I call a "pure green tea taste" is light, refreshing and has a hint of "wildness" in it as well. That said, pure green tea - that is, green tea that has nothing added into it - doesn't have the most earth-shatteringly powerful of tastes. The taste is more subtle. Due to this, numerous varieties have become available that have other ingredients added into the tea. This process of adding things into a green tea is called an "infusion." For green tea purists, adding things into a green tea is tantamount to sacrilage. For me, though, I consider such an attitude snobbery. As far as I'm concerned, the more people that drink green tea, the better. And if infusions to the tea that provide unique and flavorful tastes to the tea accomplish this, then so much the better. Plus, let's be real here. Who really wants to drink the same tea over and over and over again? Drinking a good "pure green tea" is indeed great. Yet, I personally love green teas that have something added into them at times too. To this day one of my favorite green teas is a spearmint infused green tea from Tazo that so nicely melds the qualities of green tea with a light touch of spearmint. Moreover, as was mentioned in the Health Benefits of Tea, the antioxidants found in all teas and in green tea in particular can go a long ways towards preventing diseases of various kinds. And the additions of "other things" into a green tea do NOT, in any way, reduce the health effects of green tea. Because of this, in my opinion, it is wonderful that all these "flavored green teas", for lack of a better word, have sprung up - as they essentially allow someone who may not like the subdued taste of pure green tea to find a green tea that they DO like while receiving the benefits of drinking green tea at the same time. All in all, a winning combination. To learn more about the specific types of green tea available, see the page on this site that provides detailed information about the Different Types of Green Tea.